The run up to Photokina, the world's largest photography trade show, is always proceeded by product announcements from all the major camera manufacturers. But this is the first one this year to get me excited - the Fuji X100. It's a traditionally-styled rangefinder camera with a 12MP APS-C sensor and a fixed 35mm f/2 lens. It has a manual shutter speed dial, aperture ring and exposure compensation dial, is small and compact, and is almost the antithesis of every other digital camera on the market - with the exception of the ridiculously priced Leica M9 and X1. It also has a cleverly designed viewfinder - a hybrid rangefinder and high-res electronic live view finder with the ability to switch between the two. You can have the optical finder with a histogram superimposed, or use the 1.4MP electronic finder for through-the-lens viewing. If it works as well as described it should be perfect. I spent many years shooting with manual Nikons in my early days, first the FE2 and later the FM3A. I sold them when I went over to Canon digital cameras, but I've been on the verge of buying another one over the last month or two to be my 'fun' camera, as I just miss the beautiful feel and operation of a manual camera. I have kept on hoping that Nikon might release a digital version - an "FM3D" - sometime, but so far have been disappointed. Although it won't hit the shelves until 'early 2011', Fuji are to be applauded for breaking the mould and producing a really distinctive camera. Being a premium niche product I'm sure it's not going to be cheap, but if the ease of operation and image quality are up to the mark then I will almost certainly be buying one. 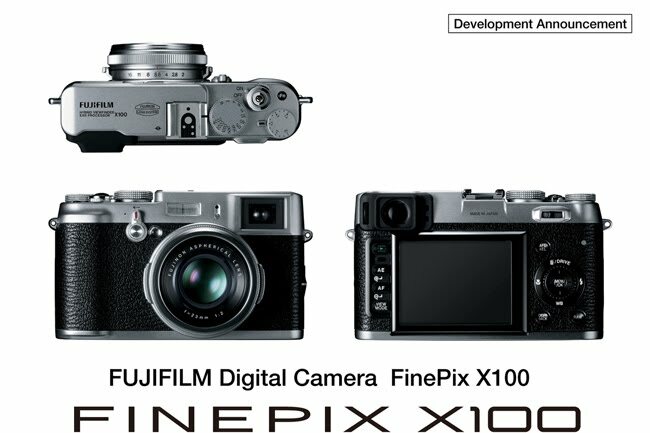 And, if the X100 sells well, then maybe Nikon will develop that FM3D I've been hankering after.